Champagne House Laurent-Perrier brings to this year’s TFWA World Exhibition a new limited-edition gift box for its flagship Cuvée Rosé. With its gold and pink lace effects, the Ecrin – a collector’s piece – opens up to reveal the silhouette of the rosé champagne. Breaking new creative ground, the Ecrin features the monogram initials of Laurent-Perrier as well as the oval label of Cuvée Rosé Laurent-Perrier. 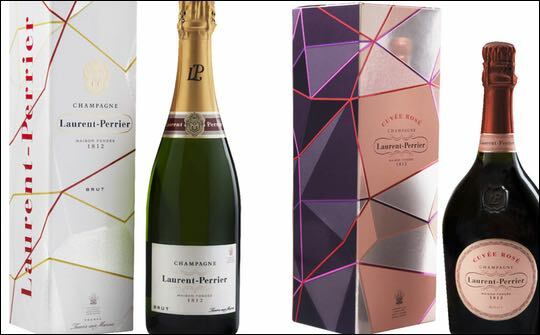 Laurent-Perrier has also launched two faceted champagne cartons with seasonal sparkles – perfect for festive occasions – and a shiny new sleeve on its Laurent-Perrier Brut, which celebrates the freshness and elegance of the non-vintage brut, the signature of the Champagne House’s style. The Ecrin Cuvée Rosé Laurent-Perrier, RRP €75 for a 75cl bottle, is available from wine merchants and travel retail outlets. Laurent-Perrier Brut in its sparkling sleeve RRP €35 and Cuvée Rosé Laurent-Perrier in its sparkling gift box, RRP €70, will be available from selected stores and wine merchants from October 2015. All will be on display at TFWA.